Longtime supporter of the Virgin Gorda Festival Sub-Committee, and V.I. Festivals as a whole, Ms. Franka Pickering is this year’s Easter Festival Village honouree. The tribute was announced by Members of the Committee during last month’s Easter Festival launch. The consensus in the community is that the honour is fitting and overdue; local people explained that over the years Ms. Pickering has indeed been a pillar not only to the Festival Committee, but of the Virgin Gorda community as a whole. 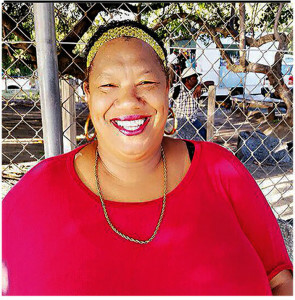 In light of the announcement The Island Sun newspaper is pleased to feature Ms. Pickering in this week’s edition and highlight her contributions to the Virgin Gorda Community over the years. As the managing Director of Joys Mini Mart, Franka is very enthusiastic of her business profession. She opened the doors to Joys Mini Mart in 1992, and Tropical Gift Collections in 1994, while still managing the financial side of several companies. After several years she closed the doors of Tropical Gift Collections due to the dwindling economy. Aside from being a business woman, Franka is also an artist, leader and a genuine community person. Franka was born on the island of Tortola and is loved by all who met her. She has a great sense of humor and, will turn the light on during your darkest day. In 1973 she moved to Virgin Gorda and, after one year decided she needed to further her education and moved back to Tortola. In the late 70s Franka worked with the BVI Festival Committee for many years in which the Committee was able to obtain the franchise for our Miss BVI to compete in the Miss Universe pageant. She also accompanied the first Miss BVI to Labour Day in Brooklyn (USA) Miss Ferdinand. Franka was asked over the years to assist the Virgin Gorda Festival Committee in their judging of shows. She also worked with many contestants who competed for the title of Miss Easter Festival. Franka was known for her ability in dancing, make up and designing evening gowns not just for Queen Shows but for persons attending weddings and functions. Franka is also a torch-bearer of the St. Ursula Catholic Church and, has served this Parish from choir to finance chairperson to Eucharistic Ministry and so much more for over 25 years. In 2006 she was awarded PRO ECCLESIA ET PONTIFICE award from The Holy Father, Pope Benedict XVI. She resigned her many positions in 2013 so others can experience what she did. She has been a Lion member for over twenty years and has served in most capacities. She has won several awards and was honoured as a Melvin Jones Fellow, one of the highest honours’ in Lionism. Working with Festival Committees has always been a love for Franka and in the 90s she helped on more than one occasion to bring the Committee back to life after taking a fall. In 2001 she was asked to manage the Committee a few weeks before the festival date. After the first year she was asked to continue. She stayed three years and then felt she should resign and let someone else manage it. In the past couple of years she was happy to assist the Committee once again. In 2008 she became the first female President of the BVI Football Association and, the first female President in the CONCACAF district. Franka also is the President of the Virgin Gorda Diabetes Associations and has been a member for over fourteen years. On 20 November 2015 her dream came through when she opened the doors to the first office of this Association. She has sat on many boards and committees in the public sector, and has served on the BVICCHA board several times, Board of Trustees at Cedar School, PTA President from Primary to Secondary Schools, VG Cricket Association, Virgin Gorda Football League and, many more. Presently she is sitting on the Boards of the Virgin Gorda Garden Club, BVI Recreation Trust and the BVI Diabetes Association. Franka was educated in the areas of Accounting, Management, certification in leadership, social work, religious education and, diverse counselling abilities. She attended several seminars, workshops and conferences. At present Franka is working behind the quiet walls, on a cook book and a poetry book, which she would like to publish sometime in the future. She has gotten back into her artistic side and is trying to do some canvas painting and rock painting. One of her last community projects that has been challenging her is to start a reading council on Virgin Gorda. She has been working with Mrs. Lynden Smith on the formation of the project. The challenge is finding a room to house it. Being recognized as one of the most influential persons in community service she will not stop until she has completed this task. She has two children, one in aviation, accounting, marketing and inventory and, one in business Management, Tourism /Hospitality Management and Music.